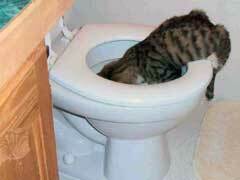 While a cat vomiting causes some distress for the cat, it often causes much more for the owner. However, it’s important to note that a cat throwing up now and again is actually quite normal. On the other hand, if other signs begin to appear, then you may be dealing with sick cat symptoms. Below are some cat vomiting causes, and what concerns an owner should have. 1. Hairballs — Hair they ingest not going through their system completely is the most common of cat vomiting causes. For cat hairball prevention, brush and comb your fat frequently, try a hairball reducing diet, or a hairball cream. 2. Eating too Fast — Some cats are simply aggressive eaters and attempt to eat too much too fast. Feed them smaller amounts more frequently, and reduce any possible stress around mealtime. 3. Cat Vaccinations — While very important for your cat’s health, there are some side effects to vaccinations, including vomiting. This should pass. 4. Eating Inedible Material — Cats love to chew on things other than food, and the cat vomiting causes the rejection of inedible material. 5. Diet Change — If planning to make a major change in your cat’s diet, do so gradually and this should prevent vomiting. 6. Food Intolerance — An allergy or other intolerance can cause a cat to vomit. Check for symptoms such as rash, break outs on the face, or hair loss. 7. Infections — A feverish cat also vomiting may be fighting off infection, and should be brought to a vet. 8. Poisons — A cat may vomit in an attempt to reject a toxin or other poison they’ve ingested. Seek a vet immediately if you believe your cat has been poisoned. 9. Parasites — Parasites or fungus like ringworm in cats can cause excessive vomiting. If you see other symptoms, take the cat to the vet. 10. Illness — More serious illnesses are cat vomiting causes. Kidney or liver disease, adrenal gland disease, pancreatitis, or even neurological disorders can bring on vomiting. It is up to a careful eye to tell the difference between the occasional upset stomach or a more serious condition.